With cannabis prohibition finally over in Canada, British Columbia is bracing itself for a new era of economic potential. The sale and distribution of cannabis in B.C. will be managed and implemented by BCGEU members across the province working in brick-and-mortar stores, like the first BC Cannabis Store in Kamloops, as well an online store. Additional stores will begin opening in the next twelve months as hiring continues to intensify all across the province. “Responsible retail of recreational cannabis by professional BCGEU members at BC Cannabis Stores will ensure that cannabis stays out of the hands of minors, while providing a world-class retail experience for consumers” said Smith. The BCGEU represents over 4,900 members at the Liquor Distribution Branch and over 77,000 workers across the province. Six BCGEU members who work for the Ministry of Social Development and Poverty Reduction met with minister Shane Simpson late last week. The members are from BCGEU Component 6 - Social, Information and Health and Component 12 – Administrative Services. The meeting was organized by the union so that the minister could hear firsthand the issues facing workers on the front-lines in the hope they can be addressed by the government. These issues include: overwhelming workloads, the need for more staffing, work performance measures, problems with the current service delivery model and computer software, and unnecessary duplication of tasks. "Our members' clients have complex issues. The existing staff cannot handle the present volume of work. It's disheartening and frustrating for our members to not be able to provide the highest quality service to those who need it," said Judy Fox-McGuire, the vice-president of the BCGEU's Social, Information and Health component. "Our members told the minister about their passion for helping clients and the pride they take in their work. At the same time, they're worried clients aren't getting consistent, dignified and fair service. The result is diminished morale. We need to find solutions to guarantee better client service and better working conditions," said BCGEU president Stephanie Smith. Our union intends to continue working with members and the government to find ways to resolve the problems. "The minister wants to change the culture of the ministry and we believe it will happen. He also indicated he wants to hear our ideas, our creative solutions to problems. We're urging BCGEU members to share their thoughts with their BCGEU local so we can get them in front of the minister," said Fox-McGuire. In a report released last April, B.C. 's Ombudsman Jay Clarke made nine recommendations aimed at improving services. The report confirmed what the BCGEU has pointed out for years regarding the long wait times and inadequate service levels. "Implementing these recommendations would go a long way to addressing the issues our members raised with the minister," said Fox-McGuire. Yesterday, I had the honour of presenting the BCGEU submission at a public hearing in Mission. Our submission reflects the feedback of your senior elected leadership regarding the priorities and challenges of their members living and working in communities all over B.C., and is supported by the rigorous and comprehensive work of Research & Interactive Services (RIS) staff to research and document relevant factors like the state of our economy, the impacts of legislative and policy changes, and opportunities for innovation. RIS research shows a strong fiscal and economic outlook for 2019 and we believe that gives the government the opportunity to continue the spirit of bold policy changes started in last year’s budget and go further, faster in some key areas. Address housing affordability and supply. I spend hundreds of days a year on the road visiting members in their worksites and the housing crisis comes up all the time, everywhere. The government has done a lot of work on this issue but it isn’t enough. Our submission urges the government to expand and accelerate direct investment—including capital funding and land contributions—in a broad range of affordable housing options—including public, co-op, social and non-market. Budget for an effective poverty reduction strategy. Since 2017, I have had the honour of serving as the sole representative of B.C.’s labour movement on the Minister’s Advisory Forum on Poverty Reduction and I commend the government for launching a provincial poverty reduction strategy as a priority for 2019. Our submission urges the government to go take steps to rebuild the vital public services and programs that will supply the education, training, child care, social services, health and regulatory services that will determine the long-term success of that strategy. Protect B.C.’s environment and natural resources. The economic, health and human impacts of B.C.’s floods and wildfires are impossible to ignore and expected to get worse. The deterioration of our public parks and natural resources are also reaching crisis levels. Our submission urges the government to restore staffing and resource levels in the key ministries and agencies responsible for protecting B.C.’s environment and natural resources including BC Wildfire Service, BC Parks, Emergency Management BC, and the various offices and agencies responsible for analysis, compliance, and enforcement related to environmental protection and natural resource management. Restore funding to our justice and corrections system. Beginning in 2002 budgets for B.C.’s justice system, courthouses, jails and legal aid offices were slashed. The result in 2018 is a system where access, timeliness, staff and public safety, program effectiveness, and the human dignity of clients all continue to suffer. Our submission mirrors the campaign work the BCGEU has done for the last several years, especially through our “Prison Safety Now” campaign, and calls for additional resources and the restoration of the funding necessary to rebuild a functional, effective, and safe system. Our submission also included several well-researched revenue-generation ideas to ensure stable, ongoing funding for our priorities. While this is common practice for us, the Committee informed me yesterday that it makes our submissions unique. I want to thank your elected leadership for passing on your priorities. I want to thank the talented and dedicated staff in RIS who actually worked around the clock to put this document together on an extremely tight timeline. Finally, I want to encourage all of you to take the time to read our submission. I look forward to continuing to work with your elected leadership, the staff of the BCGEU, and our provincial government to ensure our priorities are reflected in Budget 2019. On Friday, September 15 Gateway Casino filed an application in BC Supreme Court seeking an injunction that would have severely restricted picketing at the Penticton location. Gateway's application relied on video and other evidence that allegedly showed our members trespassing, delaying vehicles, and intimidating casino clients. The Court heard the application on Monday and issued a ruling on Wednesday, September 19th. The Court denied Gateway's application because the evidence presented did not show unlawful activity by BCGEU members. This ruling is great news-not just for BCGEU casino workers currently on strike at Gateway's four Okanagan casinos, but for all unions in BC-because the Court's oral reasons uphold picketing as an exercise of free expression and workers' rights. While this ruling is something to celebrate, the Court also directed BCGEU leadership to communicate with our members about the principles of lawful picketing and the potential dangers of unlawful activity on the picket line. I support this direction from the Court because I believe it is vitally important that our members on the line in the Okanagan are exercising their rights in a way that ensures Gateway will not be able to return to Court to try for another injunction in the future. The principles below relate directly to Gateway's allegations and don't cover all aspects of picketing but they should be very familiar to many of you because they reflect the direction the BCGEU gives to all members on the line. If you have questions about these principles or any other aspect of picketing, please refer to that written direction and contact your picket captain. I've had several opportunities to visit and walk all four picket lines since June 29th and I'm impressed with the strength and solidarity shown by all of our striking casino workers. On behalf of your union, I'm proud to stand with you and support you as you fight for the fair collective agreement you deserve. Minor, incidental use of private property, such as momentarily stepping on a sidewalk to get out of the way of vehicle traffic, is not unlawful. Picketers may not follow vehicles into the parking lot, or otherwise proceed into the property. Verbal insults are not unlawful but picketers should remain courteous and respectful even when managers and/or clients are not. If managers are recording the activity of picketers, picketers should be recording as well. Picketers may walk across entrances and exits at a normal pace. If a vehicle arrives while a picketer is in the entrance/exit, the picketer should continue to the other side. If a vehicle approaches or is in an entrance/exit where picketers are not currently walking, picketers should not walk in front of that vehicle. When a vehicle stops to wait for picketers to clear an entrance/exit a picketer may approach the driver, explain the reason for the picket line, and ask the driver not to cross it. During this interaction, it would be best if the picketer had leaflets to hand to the driver. The interaction may continue as long as the driver wishes. Picketers may not stand or walk in front of a vehicle crossing the picket line. The driver must be able to safely cross the picket line if they choose to. There is a groundswell of change happening in Canada with respect to relationships between Indigenous and non-Indigenous communities. The BCGEU has always strived to be a positive ally to Indigenous Peoples and as part of our ongoing work to put this commitment into action, I am pleased to provide you with a copy of the BCGEU guide to First Nations acknowledgement, protocol & terminology. Our union expresses unity and respect for First Nations by beginning every formal meeting and union event with a grateful acknowledgement that we gather on the traditional territory of First Nations people. However, delegates at BCGEU's 2017 Constitutional Convention asked their union to go further and encourage all meetings at the local and component level to include an acknowledgement. This resulted in the development of this guide and I hope members, staff and elected representatives of the union will find it to be a valuable tool. Your suggestions and/or questions are welcome so we can continue to maintain the best resource possible. Please contact communications@bcgeu.ca with any feedback. Local government elections are your opportunity to influence decision-making in your community by electing mayors, councilors, regional district directors, school board trustees and other representatives who will take action on issues that matter for working people; issues like affordable housing, inclusive schools, and keeping services public. Polls will be open in every community across the province from 8:00 am to 8:00 pm on Saturday, October 20. These candidates have been endorsed by their local labour council and/or the BCGEU based on their platforms and where they stand on issues affecting working people. October 4th is a day to honour the lives of Missing and Murdered Indigenous Women and Girls (MMIWG) and their families. The Native Women's Association of Canada invites all family members, Indigenous community members and allies to take some reflective time on October 4th to attend a vigil or a community event or take a moment of silence to honour our stolen sisters and to support all families and families of the heart. Agassiz – The Agassiz United Church Outreach Program will be hosting a candlelight vigil on-site. Alexis Creek – Tl'etinqox Health Services will be holding a candlelight vigil, drumming and prayer at the Tl'etinqox Health Centre. Courtenay – North Island Students' Union @ North Island College will be welcoming Elders and dancers from K'omoks First Nation and will hold moment of silence in the Courtyard at Discovery Hall. Fort Ware – The Kwadacha Education Society will be hosting a moment of silence and will be doing the heart activity, and beading heart pins. Gibsons – School District No. 46 (Sunshine Coast) and Aboriginal Programs and Services will be holding moments of silence in various classrooms across the district. Kamloops – Thompson Rivers University Status of Women will be holding candlelight vigils and a moment of silence throughout various sites on campus in Kamloops. Kelowna – The Ki-Low-Na Friendship Society will be hosting an opening prayer, walk, dinner, speech, sharing stories, closing circle, prayer, and moment of silence on-site. Masset – Haida Health Center will be hosting a candlelight vigil at 347 Eagle Avenue. Nanaimo – Vancouver Island University Student Union Shq'apthut "The Gathering Place" will be hosting a gathering with a speaker and a display of cards filled out in remembrance of women affected by violence; on-location. New Westminster – Douglas Students' Union will be holding a candlelight vigil at AB Atrium of Douglas College (Coquitlam). New Westminster – Douglas Students' Union will be holding a candlelight vigil at the Main Concourse of Douglas College (New Westminster). Oliver – Osoyoos Indian Band will be hosting a prayer, speakers, a barbecue lunch, and a balloon release at the Osoyoos Indian Band Office. Penticton – Okanagan Nation Transition Emergency House and Lower Similkameen Indian Band will be hosting a dinner, speakers, and a march at Victory Hall. Port Alberni – Eight Avenue Learning Centre will be holding a moment of silence and information session on healthy relationships. Port Alberni – Port Alberni Friendship Center will be holding a candlelight vigil with a connecting with the land spiritual practice. Prince George – College of New Caledonia Student Union, Aboriginal Resource Center, and CNC Friendship Center will be hosting a candlelight vigil and moment of silence at The Gathering Place, College of New Caledonia. Summerland – Summerland Secondary Me to We Club. Will most likely hold a moment of silence. Terrace – Coast Mountain Students Union and Kermode Friendship Society will be hosting a vigil and moment of silence at Kermode Friendship Society Admin. Vancouver – The Indigenous Law Students Association (UBC) will be hosting speakers. They will also display a moment of silence inside, candlelight vigil outside and will be placing candles in the Reflection Pond. This will all be taking place at Allard Hall. Vancouver – Redeemer Lutheran Church will be holding a candlelight vigil and moment of silence. Vancouver – Vancouver Community College & Students' Union of Vancouver Community College will be hosting info and resources for students at 1155 E. Broadway. Vernon – Okanagan Indian Band will be holding a "See Me, Hear Me, Remember Me" Red Dress Campaign, Speakers, candlelight vigil and hanging Red Dresses. They also welcome any hand drummers to this event, which will take place on-location. Victoria – AOS Partners will be holding a moment of silence at their workplace. Victoria – Camosun College Student Society will be holding a school assembly on the Lansdowne Campus. Whistler – Linda Epp and the Howe Sound Women's Centre will be hosting speakers and will be having a peaceful walk from Whistler Village Common Area to Olympic Plaza. They will also include singing and drumming followed by a display of First Nations song and dance. There will also be healing ceremonies at Squamish Lil'wat Cultural Centre. 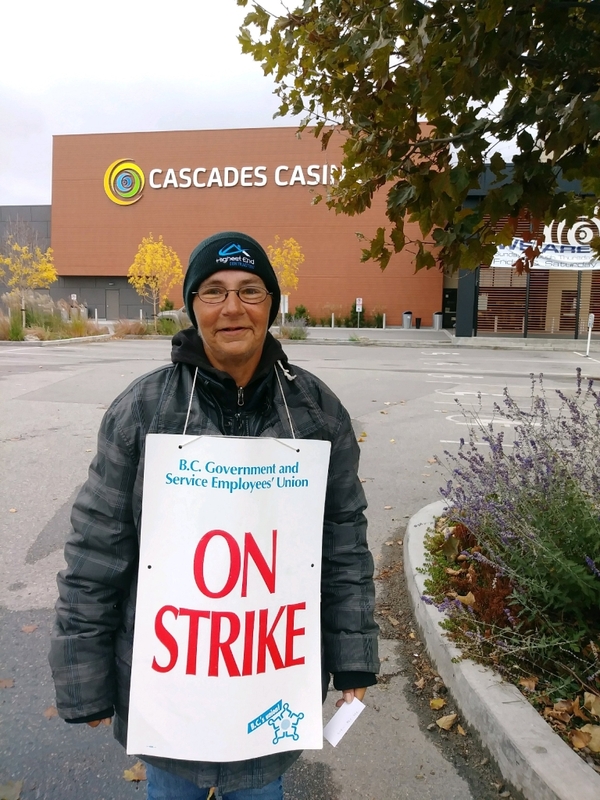 (Thompson-Okanagan) As the strike at Gateway Casinos in the Thompson-Okanagan continues, BC Government and Service Employees' Union (BCGEU) members are opening up about why they are holding out for fair wages despite being on the picket line for over three months. "Over the years I've struggled as a single mom to make ends meet," said Cheryl, a slot attendant who has worked at Gateway Casino in Penticton for over ten years. A cook at Playtime Casino in Kelowna, who has asked not to be named, described how he and his wife, who both work full-time jobs, find it difficult to provide for their family. "I'm a proud father of four kids, but working two jobs like I do, I don't get a lot of time to spend with them," said the cook. "Our members' stories are heartbreaking illustrations of the cost of Gateway's 'profits before people' approach," said BCGEU President Stephanie Smith. "It's shameful for a multimillion-dollar casino company to force the employees that make it profitable to live in poverty." Smith continued "I'm inspired by our members' resolve to do whatever it takes to get the wages and benefits they deserve and I'm proud to say they're union is behind them 100%." Mediated talks between Gateway Casinos and over 675 members of the BCGEU in the Thompson-Okanagan broke off in September after the company refused to release financial information to back up claims that they cannot afford the workers' wage proposals. "I've been with Gateway Casinos in Penticton for over 10 years. I first worked in the cash cage and then switched to being a slot attendant to get shifts. Over the years I've struggled as a single mom to make ends meet. With the wages Gateway has been paying, I've had barely enough money to put food on the table. After picking and choosing which bills I could pay there has been no money left over for things like holidays or extra-curricular activities for my kids. Some years I couldn't even afford school photos. Even with tips it's hard to get by. Having to hope that you get enough in tips at the end of the month to pay rent is stressful. If you get sick you don't get tips. If you take time off you don't get tips. Because of the low wages, I haven't been able to save any money. Six years ago, I had to have my teeth pulled and now, because of complications, it's going to cost me $10,000 to get dentures. I don't have that kind of money and my benefits will not cover much. I don't know what I'm going to do. The wage increase I would get with Gateway's offer is not much more than 50 cents per hour. That won't help me get my teeth fixed. The fact that they have no recognition for long-term employees and are offering no increases to benefits is an extra slap in the face for me personally. I'll be out here on the picket line until they step up and pay us what we are worth." "I'm a cook at Playtime Casino in Kelowna and my wife and I are struggling to get by. We both work full-time-I even have a second job-and we still live paycheque-to-paycheque. I'm a proud father of four kids, but working two jobs like I do, I don't get a lot of time to spend with them. My son has autism, and the extra costs for learning aids, medication, and other tools to help him cope add up. We are only able to take him to his much-needed therapy one day a week because we can't afford anything more than what the government pays for. My benefits don't help with that at all. I'm on strike because Gateway is not offering a living wage. I make maybe $30 in tips per week-if that. No one in the kitchen makes more than an average of about $1 an hour in tips. We cannot rely on tips to survive. It's the little things-we have to pay for our own parking when we work at Playtime. We aren't allowed to use the customer parking. Anytime there is an event near the casino I have to get to work a lot earlier just to find a spot. Gateway is a multimillion-dollar company and they can afford show us some respect and pay a decent wage."